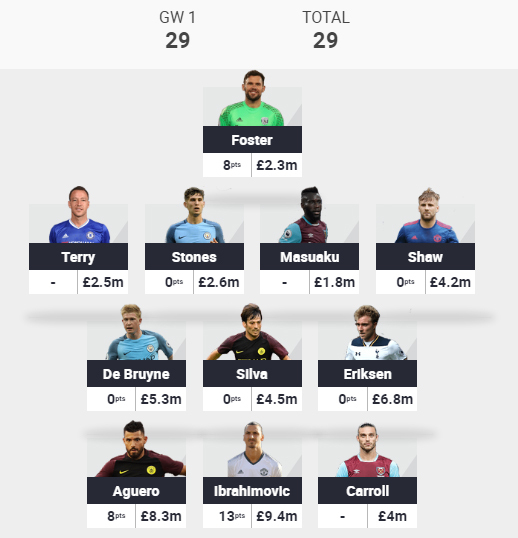 Overall a disappointing start after GW1. However the team was picked around good fixtures for West Ham (who haven’t played yet) and Man City during GW2. Both have European qualifiers giving them extra games during August and the potential for scoring more points. Ibrahimovic scoring on this premier league debut and getting star man ensured he picked up 13 points. It was a tough decision to include him or not but it was a choice that already looks like it will pay off long term. Aguero making the start I’d expected. Aguero tends to be the must have striker for every season I’ve been involved in Dream Team – grabbing a goal in the first game was came as no surprise. Clean sheet for Foster. Going for a cheaper option in goal was a bit of a gamble, however West Brom seemed solid at the back. Hopefully cutting costs in this area will allow funds to be spent elsewhere in the team with a steady flow of points from the West Brom shot stopper. Man City just managed to squeeze past Sunderland. I’d built my initial team with a core of Man City players hoping they would hit the ground running. Silva, Stones and De Bruyne picking up zero points against a Sunderland team who may be in a relegation battle already puts a question mark next to this decision. Liverpool making a strong start to the season against Arsenal could be an area for long term concern. Coutinho is a player I’d considered picking my starting team. However due to the lack of European football I’d opted against any Liverpool coverage. This could be a mistake. At this stage, I have no plans to change anything for Game Week 2. 6 of the players chosen are involved in European qualifiers. After a poor start I’m hoping the decision to pick a team around these extra fixtures will pay off. My advice for anyone already looking to make changes would be to follow the same pattern. A must have player for this week would surely be Aguero. After picking up a goal this week, it’s hard to imagine that he won’t be amongst the biggest point scorers with two fixtures in week 2.